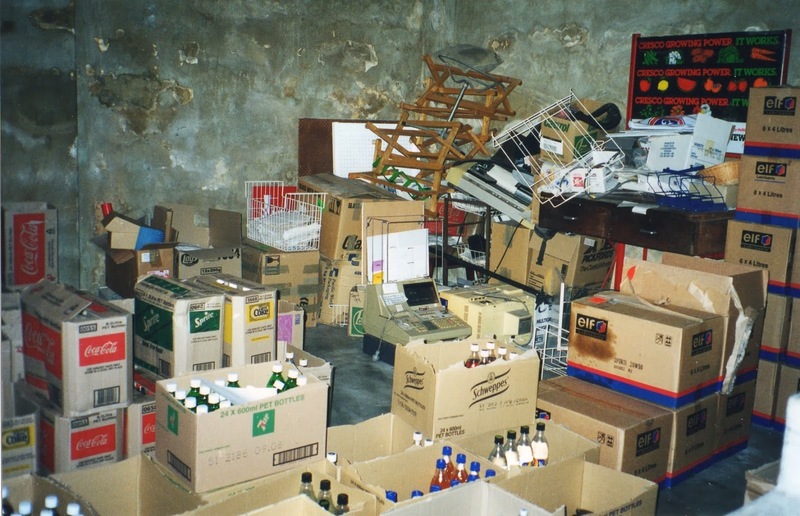 I found some old photos of where I used to work! Pies make me think of petrol stations. Where else can guarantee that there will be a Mrs Mac's waiting for you, if you are desperately in need of food on the run? The sight of someone walking out of a petrol station with a pie in one hand and a Coffee Chill in the other is very familiar to me. I used to work at a petrol station and making sure that the pie warmer was filled with Mrs Macs was important. It involved defrosting pies taken from the freezer and microwaving until heated, and then shoving them to the very back of the pie warmer in the hope that they will sit there for at least half an hour or (preferably) more so that the pastry will crisp up a bit before it gets bought. A steady rotating supply of pies was needed so that there was enough to meet the flow of customers through the station, but not so much that at the end of the day there were pies left in the warmer that have been sitting there for more hours than you can count on one hand. Then it’s a game of pie roulette! I was a part-time servo chick during my first few years of university. It was my first ‘real’ job. 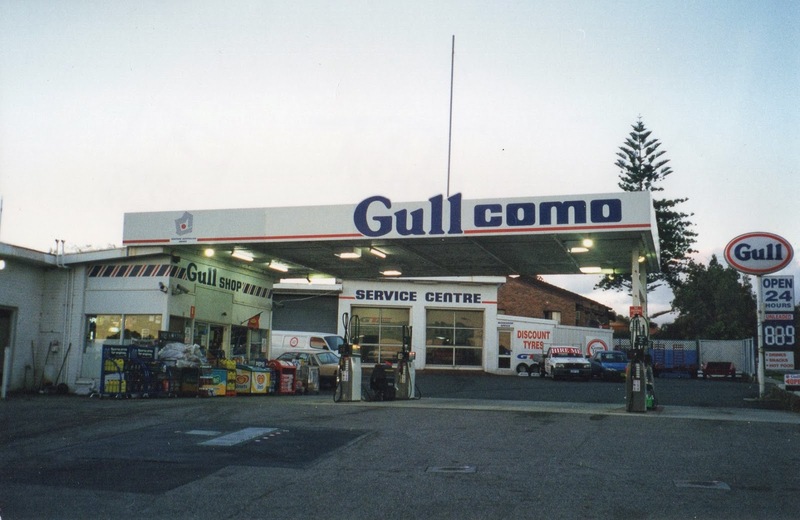 I worked at Gull Como on Canning Highway. 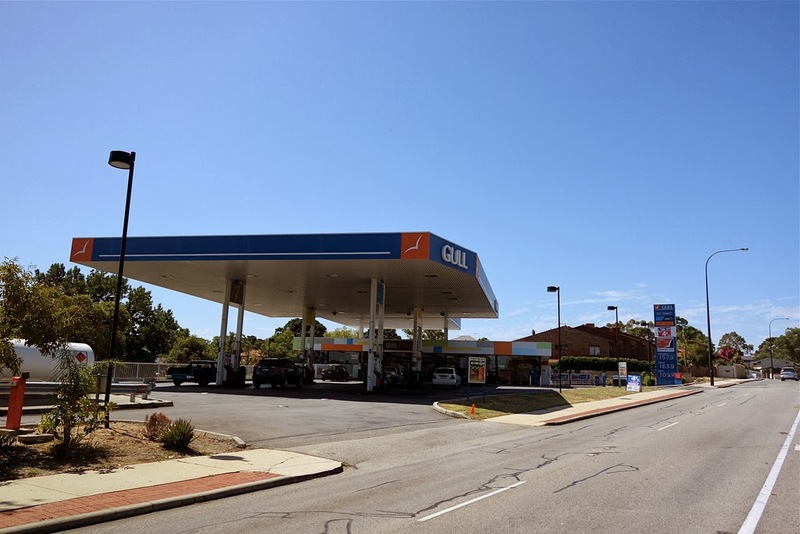 It was one of the oldest petrol stations and had probably been around for 20+ years. We’d often joke about how it was falling apart, especially the basement, which we called the dungeon. After 2 years, I stopped working there as it had to be knocked down and rebuilt, and now the biggest petrol station that I know of stands in its place. I enjoyed working at a petrol station, but maybe more because I thought well at least I’m not working as a check-out chick or at a fast food joint which is what people’s first jobs usually are. Working at a petrol station has way more street cred, there is a higher probability of being held up than other jobs! It never happened to me but some of my colleagues did get held up. When it started getting dark at night, we had to put up a cage around the counter, but it was too heavy for me to lift so the guy who did the graveyard shift at 9pm would put it up when he started his shift. I didn’t do any graveyard shifts (my parents were against it! ), my earliest shift was 6am and my latest 9pm. Have you ever seen the movie Clerks? Well that’s what it was like working at a petrol station. 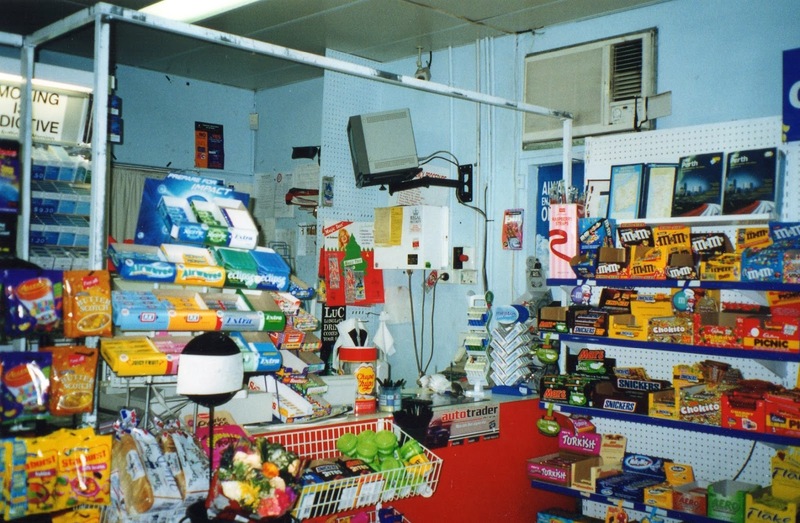 Besides being a place for everyone to fuel their cars, we were a one-stop convenience shop for all things needed by humankind and as we were open at all hours, everyday of the year, you meet people from all walks of life. I worked alone on my shifts and was kept entertained with stories about other peoples shifts and random customer encounters as employees spent their time scribbling into a thick spiral bound notebook which we called the ‘Gull Papers’. You are also faced with customers asking a lot of stupid questions. There would be the usual ones of “what time are you open till?” [we were a 24 hour petrol station, we never close] and “how much is this?” [I didn’t get why people never looked at the signage or price tags first before asking]. Sometimes I’d get a customer who wouldn’t say anything, like I’m supposed to do all the talking and guess which pump you just used to fill up your car because I’m like psychic…not! • So where are you from? • Do you speak Mandarin? • You speak English really well…. and I could go on but you probably get the point. I know that people generally mean well and are just curious because I look Asian and all but I was born here, I’m Australian, mate. Oh and then there was this other question or maybe more of a comment? a punch line? statement of the obvious? Correct. Unintentional though. I didn’t love my job that much to dye my hair the same colour as my uniform but back in the days when I worked at Gull which has blue as its colour scheme, was during the time that I was dying my hair blue. My black hair bleached until it was unrecognizable and then Fudge Blue Velvet went in. Without a doubt, at least 10 customers during every one of my shifts would think that telling me that my hair matched my shirt was a great conversation starter….um no…but carry on. I dyed my hair blue because it’s my favourite colour, this is a pretty logical reason for dying one’s hair right? If you didn’t already know, this is why my food blog is called Blue Apocalypse as my hair used to be blue and as a huge Tool fan I used blue apocalypse which comes from the Tool song Eon Blue Apocalypse as an internet alias for various things and it also became the name for this food blog. I’m Australian mate, can’t you tell? The meat pie is iconic in Australia and some even refer to it as the national dish. 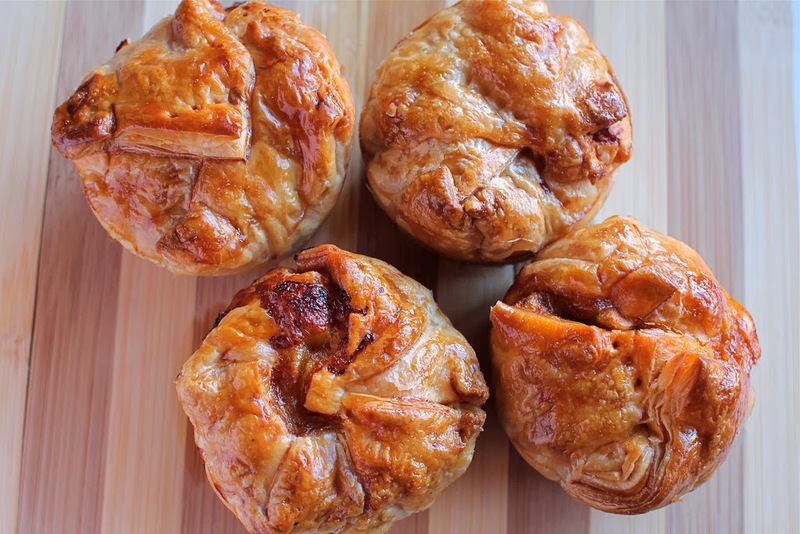 One of the best pies that I have recently had is the beef bourguignon pies from La Galette De France. It’s great to have filling in a pie that stands on its own and it gets better when wrapped in buttery, flaky puff pastry! 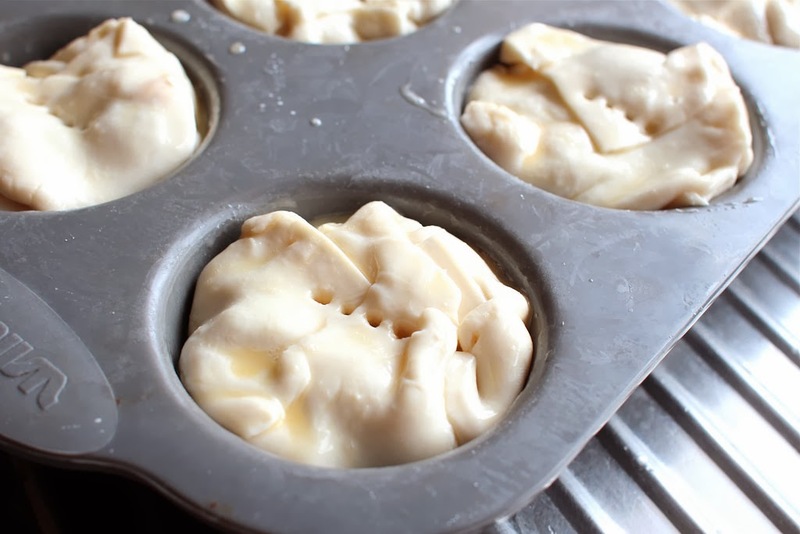 So I decided to make some at home but I didn’t have any pie tins and had no intention of buying pie pans that I would use once in a blue moon and clog up my cupboard, so I made pies in a muffin pan instead. I like how it doesn’t really look like a perfectly formed pie because it isn’t and doesn’t need to be when you are just cooking food at home. In the end what really matters is the taste. NB: Size of my muffin pans made about 32 beef bourguignon pies. In a heavy based pot (that can go in the oven), saute pancetta in 1 tablespoon of olive oil for a few minutes until brown and lightly crisp. Remove and set aside. Dry beef on paper towels, it will not brown if it is damp. Heat a little more olive oil in the same pot over high heat and add the beef in batches (don’t crowd the pot or the meat will stew rather than brown) and fry on all sides until brown. Remove and set aside. Then sauté the diced onions in the pot for a few minutes until softened and starts to brown, then add in the garlic and leek and sauté for 1-2 minutes. Add carrots, celery and quartered French shallots, and sauté for a few minutes. Add in the wine and cook for a few minutes to reduce and cook off acidity. Add beef and pancetta back into the pot. Then add the beef stock, tomato paste, thyme, bay leaves, and a little salt and pepper. Bring to the boil and then place the pot in the oven and cook for 3 hours until the beef is tender (take the pot out at 2 hours to check beef doneness and taste for seasoning). Pour contents into a sieve over a saucepan and simmer the sauce until it thickens (thick enough to coat the back of a spoon lightly). Taste the sauce and season if required. While the sauce is reducing, sauté the mushrooms in a frying pan until browned. Wash out the pot and return beef to it and add mushrooms. When the sauce is done, pour over the top and combine. 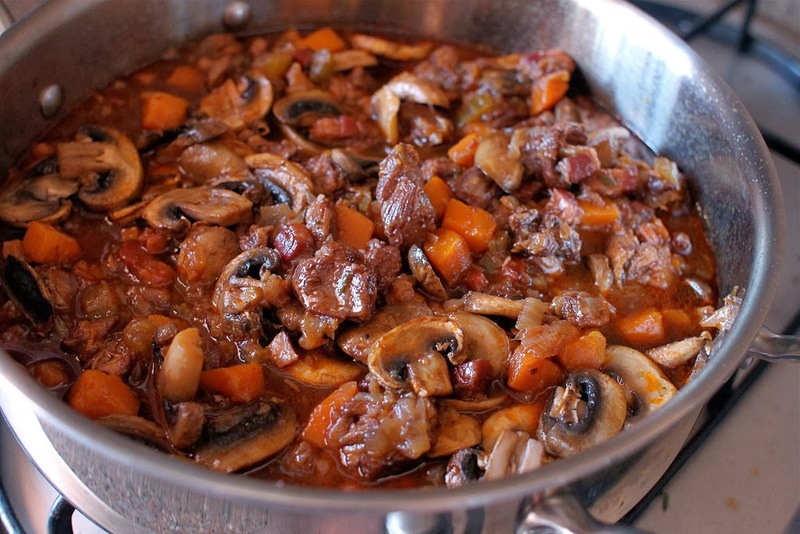 Refrigerate beef bourguignon overnight for flavours to develop and pies will taste better. 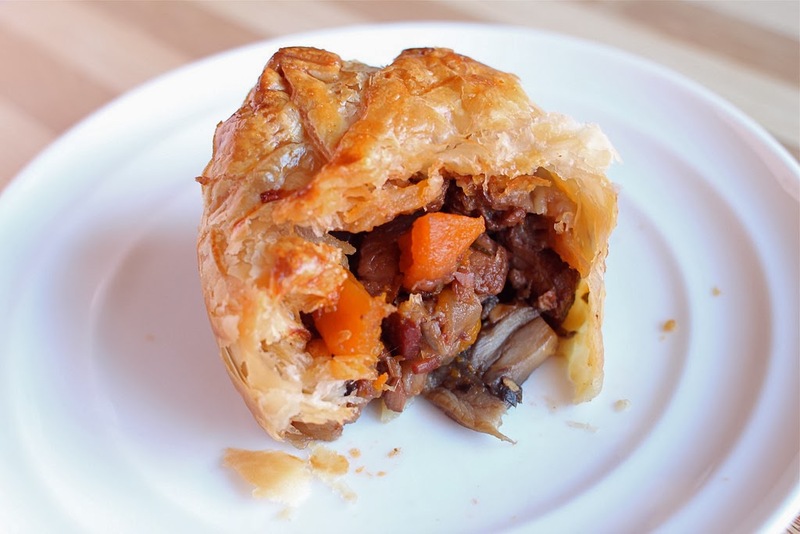 Take the beef bourguignon out of the fridge half and hour before making pies. Preheat oven to ~180C. 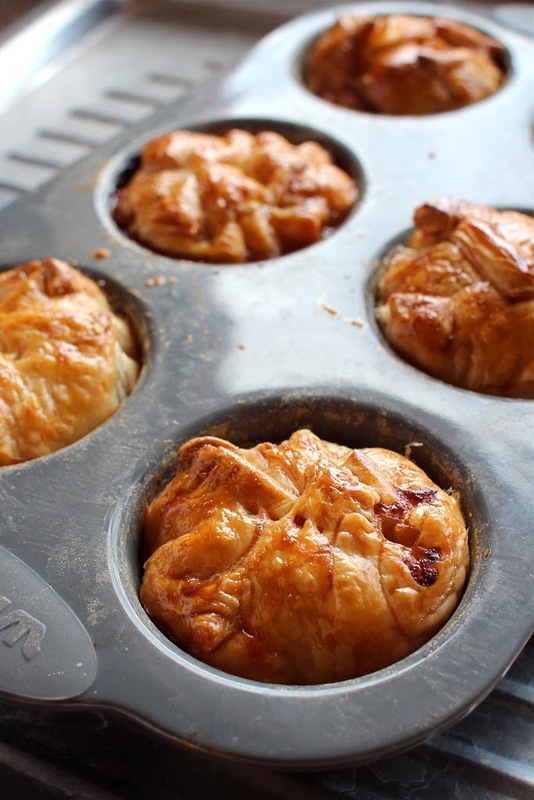 Cut puff pastry sheets into quarters and use to line each muffin pan. 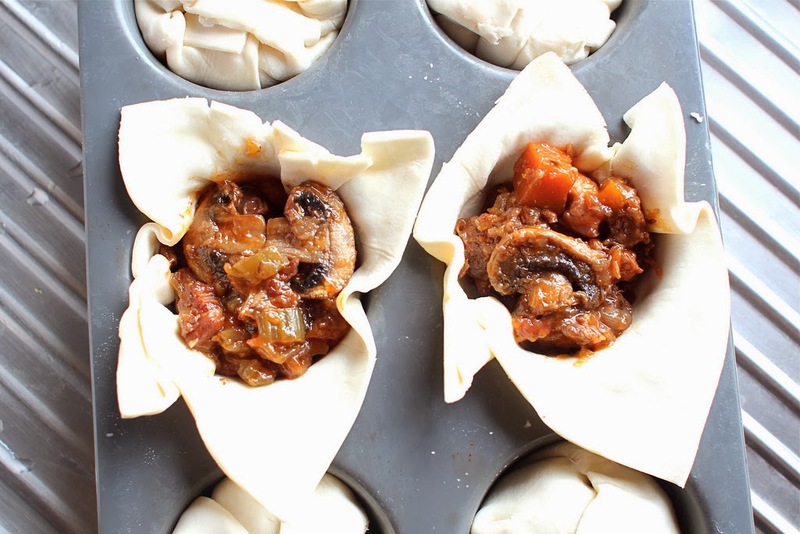 Fill each pastry cup will beef bourguignon and fold the pastry gently over the filling, making sure it is enclosed. Brush the top of each pie with egg wash and use a fork to poke some holes on top. Bake for ~ 30 minutes or until lightly browned and crispy. NB: The bottom of the pie can get soggy so it helps if you add a small piece of pastry on the bottom of the pastry cup to provide double lining. How freakin good do these pies look? Did you end up just eating them all in one sitting after the photo shoot? LOL! I love you posts that give little snap shots into your past. They make me laugh. I shared of course, took some over to my parents and froze a few too. No starch or gel thickening in the sauce and results like that? Highly impressive. Time does wonders I guess ;) Longer you cook, thicker things get. However, with my stir fries I always add in a slushy of cornflour and water mix but with this style of cooking you want the flavours to develop. I loved this post because you gave us a peek into your past. Blue hair? I love it! My hair is black too so I know what's involved in getting that colour out so you can put some back in. I made my first meat pies last year - I was afraid I'd be a failure as a new Australian if I mucked up pie making. They turned out brilliantly. Maybe not as nice as these though. Everytime I tell someone I have a blog, I then have to tell them the story about my blue hair, it's all connected. I don't think anyone can question our Australianness now with our awesome pie making skills! Oh these look amazing. Think I will need to give them a go, my husband is going to be in for a nice surprise.